I guess, it’s been rough two days for Path. Yesterday, personal social network Path was hit by a wave of controversy. 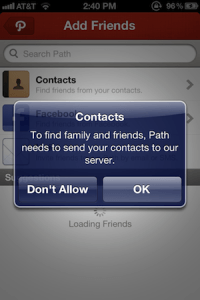 It seems old versions of path used to upload your device’s entire Address Book (your contacts’ names, emails, phone numbers, and addresses) to the company’s servers without any kind of user consent or notice. We upload the address book to our servers in order to help the user find and connect to their friends and family on Path quickly and efficiently as well as to notify them when friends and family join Path. Nothing more. 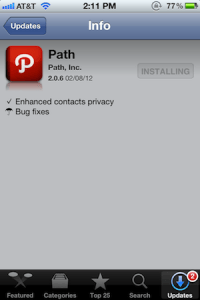 Path has released latest version just now which addresses above issue. We still love #path app. Do you? @Path Ideally this kind of mistake shouldn’t happen but appreciate the action you have taken & msg from @davemorin. Still I love #path app.